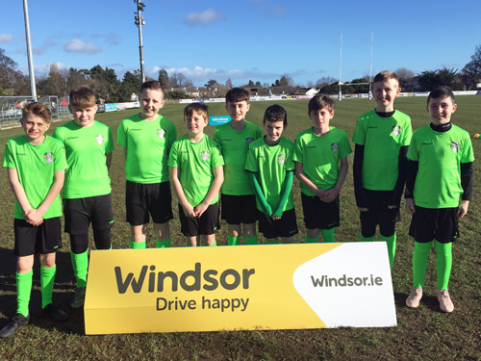 Yesterday, displaying some outside the box thinking, the club was delighted to announce its revolutionary new U-12 Academy. Following intensive talks within the club and taking into consideration the complexity of resources and facilities, we are happy to propose a unique player pathway for 65 of our members – starting with the this year’s U-12 age group. The programme will be based at Stradbrook and will include 90-minute sessions over a three-night period (Monday to Wednesday) every week. It’s being put together to prepare the players for our elite team that will participate in the national U-13 league. One of the key points will be the mentoring system. Four first-team players will be rotated every week and will be utilised to assist the younger groups. “They will train before and be with the first-team. That is fundamental to the project. The focus is on technique. But first team players will mentor the younger players. That is key.” revealed Director of Football Pat Devlin (below left, speaking at Thursday’s launch). Another fundamental aspect of the Academy will be the personnel running it. After a stellar career in the League of Ireland, England and Scotland, Gary Dempsey (UEFA A Licence – below right), will spearhead the process as the Academy Head Coach. He will be ably assisted by Dillon Foley (UEFA B coach). 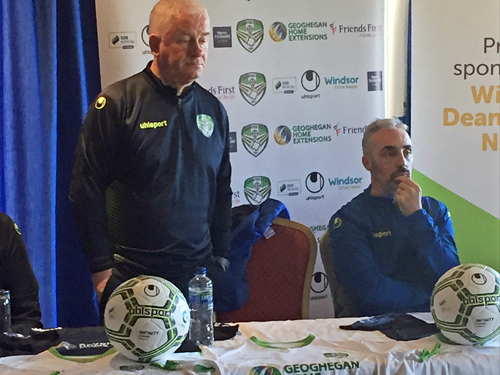 Under the guidance of Pat Devlin and Academy Manager Eddie Wallace, first team coaches Eddie Gormley and Graham O’Hanlon (both PRO Licence) will be focal points for the players through their expertise. Already in safe hands with goalkeeper coach John Power, a unique aspect will be Striking Coach Paul Heffernan who has come on board after a seventeen-year career and over 100 professional goals, in both England and Scotland. “We want everybody to come on this new adventure with us, embrace and enjoy it. This will be invaluable for the players and they will really enjoy it. The whole programme will be done with the ball – that’s the aim.” explained Devlin. The training will focus on control; dribbling, passing, shooting and defending as well as possession games. A series of seminars will also be central to the project. These will focus on the League of Ireland, playing in the UK, scholarships, nutrition as well as strength and conditioning. “We’ll have monthly meetings with the players and managers to get feedback on each player. This will give us the information we need to then go on and help anyone who needs extra work, or more specific work, to improve their game and ultimately make them better players” viewed Pat Devlin. Footnote – players will go back to train and play with their junior teams within the club on a weekly basis. We hope the programme will help the technique of all players across the board. Some great foundations are being laid for the future! My name is Hector Rodrigo Garcia and I’m Italian. For a month, I am here in Ireland and I really like the country and the people. Looking for a job, I knew that in a few days I will start the Uefa A course and since then I am trying to find everything necessary to participate in it. At this moment, the only document I need is a letter from a club, which allows me to make internships. 2) Current Coaching Experience At a minimum level, course Students must be actively coaching a team of Elite Youth* or Senior players. Applications will be considered from those not coaching at these levels provided a letter is submitted from the club/ team willing to provide an internship for the duration of the course *For the purposes of applications for the UEFA ‘A’ Licence course, a coach working with “Elite Youth” players is deemed as being those currently working at either of the following levels: • minimum of U17 National League Team • U14 Regional Emerging Talent Programme squad. Football is my life and my profession. I arrived in a moment, in which I know that all the teams and categories have their coaches, but I ask only for the opportunity to continue growing and learning in my coaching career. I already appreciate any help you can offer me. Thanks for your interest. See reply by email.